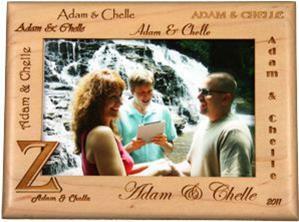 Our personalized wedding picture frame is personalized with the first names of the happy couple, the year they were married and their last initial cut into the photo area of the frame. The picture frame holds 4x6 photos. Each Frame is Personalized with the following information: Couples First Names, Year of Wedding, Last Initial cut into the photo area.